Bernard “Bernie” Sanders was born in Brooklyn, New York on September 8, 1941, to Polish immigrants of Jewish descent. After attending Brooklyn College for one year, he transferred to the University of Chicago (UC) and earned a bachelor’s degree in political science in 1964. At UC, Sanders joined the Young Peoples Socialist League (youth wing of the Socialist Party USA) as well as the Congress of Racial Equality and the Student Peace Union. He also was an organizer for the Student Nonviolent Coordinating Committee; participated in an American Friends Service Committee project at a California psychiatric hospital; and worked briefly (as an organizer) for the United Packinghouse Workers Union (UPWU), which, like all the CIO unions, had a number of influential Communists among its ranks. At that time, UPWU was under investigation by the House Committee on Un-American Activities. After college, in 1963, Sanders lived and worked for a number of months in an Israeli kibbutz known as Kibbutz Sha’ar Ha’amakim (KSH), which was co-founded by Aharon Cohen, an Arabist who was a harsh critic of Israeli policy and was arrested for spying for the Soviet Union in the 1950s. The founders of KSH referred to Joseph Stalin as the “Sun of the Nations,” and a red flag was flown at outdoor events held at the kibbutz. Sanders stayed at KSH as a guest of the Zionist-Marxist youth movement Hashomer Hatzair (HH), which pledged its allegiance to the Soviet Union; some left-wing groups described HH as Leninist and even Stalinist. HH made it plain that its cooperation with Zionists was a temporary expedient designed to help pave the way for a socialist revolution; that it viewed Israel’s independence as a transitional phase in the development of a bi-national socialist state which would ultimately end Israel’s existence as a Jewish entity. Following his time at Kibbutz Sha’ar Ha’amakim, Sanders moved to Vermont where he worked variously as a carpenter, filmmaker, writer, and researcher. In 1964 he married a young woman named Deborah Sanders; the marriage lasted only until 1966. 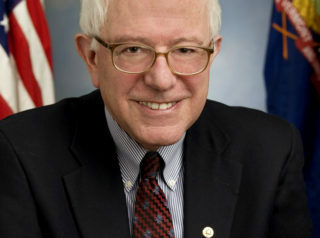 Over the next few years, Sanders worked variously as a psychiatric-hospital aide and a Head Start preschool teacher in New York; as a Department of Taxes employee in Vermont; and as a staffer for a nonprofit organization called the Bread and Law Task Force, where he registered people for food stamps. In 1969 he fathered a child out-of-wedlock. In the 1960s as well, Sanders, a self-identified pacifist, applied for conscientious objector status in order to avoid military service. His application was eventually rejected, but by that time he was too old to be drafted. In 1971 Sanders joined the Liberty Union Party (LUP), which strongly opposed the Vietnam War, called for the nationalization of all U.S. banks, and advocated a government takeover of all private utility companies. During his 1974 Senate run, Sanders said that one plan he was considering would make it illegal for anyone to accumulate more wealth than he or she could spend in a lifetime, and that any income above $1 million per year would be taxed at a rate of 100%. “Nobody should earn more than a million dollars,” he stated. After resigning from LUP, Sanders became a political Independent. In 1981 he was elected mayor of Burlington, Vermont, by a margin of just 10 votes. He was subsequently re-elected three times and served as mayor until 1989. Following his trip to Nicaragua, Sanders penned a letter to the White House indicating that Ortega would be willing to meet with Reagan to negotiate a resolution to the conflict. The mayor also sought to enlist the help of former president Jimmy Carter, telling him that the people of Nicaragua were very fond of him (Carter). Sanders even invited Ortega to visit Burlington, though the Nicaraguan president declined. By no means was Sanders’s trip to Nicaragua his only trek to a Communist country. He also visited Fidel Castro‘s Cuba in the 1980s and had a friendly meeting with the mayor of Havana. In 1986 Sanders ran unsuccessfully for Governor of Vermont, and two years later he made a failed bid for a seat in the U.S. House of Representatives. In November 1989 Sanders addressed the national conference of the U.S. Peace Council, a Communist Party USA front whose members were committed to advancing “the triumph of Soviet power in the U.S.” The event focused on how to “end the Cold War” and “fund human needs.” Fellow speakers included such notables as Leslie Cagan, John Conyers, and Manning Marable. Choosing not to seek re-election to a fifth term as mayor, Sanders spent 1989-90 working as a lecturer at Hamilton College in upstate New York and the John F. Kennedy School of Government at Harvard University. By 1990 Sanders was a leading member of Jesse Jackson‘s National Rainbow Coalition, and he ran successfully for Congress as a socialist, representing Vermont’s single at-large congressional district. In his campaign, Sanders was supported by the Communist author and journalist I.F. Stone. In 1991, Sanders founded the Congressional Progressive Caucus along with fellow House members Tom Andrews, Peter DeFazio, Ron Dellums, Lane Evans, and Maxine Waters. During the 1990s, Sanders participated multiple times in the Socialist Scholars Conferences that were held annually in New York City. Sanders was a vocal critic of the Patriot Act, the anti-terrorism bill passed in the immediate aftermath of 9/11, as an assault on civil liberties. In 2006 Sanders co-sponsored a resolution by Rep. John Conyers to impeach President Bush on grounds that he had led the United States into an illegal and immoral war in Iraq. In 2007 Senator Sanders and Rep. Maurice Hinchey together introduced the Media Ownership Reform Act, which was designed to tightly restrict the number of radio stations that any firm could own. It also sought to resurrect the so-called “Fairness Doctrine”—a measure that, if passed, would greatly diminish the influence of conservative talk radio. In March 2013, Sanders and fellow Senator Tom Harkin together introduced a bill to tax Wall Street speculators. “Both the economic crisis and the deficit crisis are a direct result of the greed, recklessness, and illegal behavior on Wall Street,” said Sanders. On April 29, 2015, Sanders announced that he was running for the Democratic Party’s 2016 presidential nomination, citing economic inequality, climate change, and the Citizens United Supreme Court decision as issues of particular concern to him. In May 2015, Sanders told CNBC interviewer John Harwood that he was in favor of dramatically raising the marginal tax rate on America’s highest earners. “[When] radical socialist Dwight D. Eisenhower was president,” Sanders said sarcastically, “I think the highest marginal tax rate was something like 90 percent.” When Harwood asked whether Sanders thought that was too high, the senator replied: “No. What I think is obscene, and what frightens me is, again, when you have the top one-tenth of one percent owning almost as much wealth as the bottom 90 [percent]. Does anybody think that is the kind of economy this country should have?” Notably, in 2014 Sanders paid $27,653 in federal income taxes — an effective federal tax rate of 13.5 percent. He described the Affordable Care Act (Obamacare) as a “modest” step in the direction of rightfully forcing the U.S. to “join the rest of the industrialized world and guarantee health care to all as a right.” “And we must do it through a Medicare-for-all, single payer health plan,” he explained. Asserting that “there is nothing more important” than fighting global warming, he said: “The debate is over. The scientific community has spoken in a virtually unanimous voice. Climate change is real, it is caused by human activity, and it is already causing devastating problems in our country and throughout the world.” He elaborated that in the absence of government intervention, America would inevitably see “more drought, more famine, more rising sea level, more floods, more ocean acidification, [and] more extreme weather disturbances,” he elaborated, in the absence of government intervention. Views on Racism in the U.S.
During a May 2016 town hall meeting in Puerto Rico, Sanders stated that he wanted President Obama to pardon the 73-year-old convicted Puerto Rican terrorist Oscar López Rivera, who had been imprisoned in the U.S. since 1981. As The New York Post explained: “López Rivera was a founder of the [Marxist-Leninist] FALN [Fuerza Armadas de Liberacion Nacional, Spanish for Armed Forces of National Liberation], which waged a violent campaign for Puerto Rican independence. [He] was arrested in Chicago in May 1981 and was convicted of trying to overthrow the U.S. government, seditious conspiracy to destroy federal property, armed robbery, weapons violations, and interstate transportation of stolen property.” Said Sanders: “Oscar López Rivera is one of the longest-serving political prisoners in history — 34 years, longer than Nelson Mandela. We are talking about a Vietnam War veteran who was awarded a Bronze Star. I say to President Obama — let him out!” Moreover, Sanders promised that “I will pardon him” if elected president. Sanders invited Paul Bustinduy, the Secretary of International Relations of the Spanish far-left political party Podemos) — which belongs to a leftist coalition called United We Can (UWC) — as his guest at the July 2016 Democratic National Convention in Philadelphia. The historian and scholar Ronald Radosh notes that UWC: (a) “models itself on the Marxist Greek party Syiriza which brought the Greek economy to near total collapse,” and (b) is “composed of old Communists, Trotskyists, independent revolutionaries, Basque and Catalan nationalists, leftist urban intellectuals and former supporters of the Socialist Party annoyed at what they perceive as its continuing compromises.” Describing Podemos, meanwhile, as “blatantly anti-Semitic,” Radosh writes: “In Madrid the [Podemos] Party’s affiliate is called Ahora Madrid. The head of Madrid’s department of culture, Guiller Zapata, who is a [Podemos] member, tweeted: ‘How do you fit five million Jews in a SEAT 600? [a version of the Fiat car of the same name] Answer: In an ashtray.’ … Podemos is so anti-Israel, that it defends publication of a notorious anti-Semitic Spanish magazine, El Jueves[which once published a cartoon] about Israel, using the symbols of Hitler’s SS to indicate that Israel is composed of Nazis.” As further evidence of its anti-Semitism, Podemos supports the Boycott, Divestment, and Sanctions (BDS) movement, a Hamas-inspired initiative that aims to use various forms of public protest, economic pressure, and court rulings to advance the Hamas agenda of permanently destroying Israel as a Jewish nation-state. The Democratic presidential primary race ended on July 26, 2016, when Hillary Clinton officially won the Party’s nomination over Sanders. All told, Sanders earned more than $1 million in 2016. That total included: (a) his $174,000 Senate salary; (b) a $795,000 advance for his book, Our Revolution; (c) another $63,750 for his forthcoming book, Bernie Sanders’ Guide to Political Revolution; and $6,735 in royalties for his 1997 memoir, Outsider in the House. In 2017, Senator Sanders’s wife, Jane Sanders, became the subject of an FBI investigation. The probe centered around a 2010 deal in which Mrs. Sanders, who at the time was the president of Burlington College, secured a $6.7 million loan from People’s United Bank and used the money to purchase a 33-acre lakefront campus for the school. But as the news website VT Digger explains, the deal was illegitimate: “Jane Sanders … overstated donation amounts in a bank application for [the loan]…. She told People’s United Bank in 2010 that the college had $2.6 million in pledged donations [from 31 people] to support the purchase of the … property. The college, however, received only $676,000 in actual donations from 2010 through 2014, according to figures provided by Burlington College. Two people whose pledges are listed as confirmed in the loan agreement told VTDigger that their personal financial records show their pledges were overstated. Neither was aware the pledges were used [by Mrs. Sanders] to secure the loan.” For example, a separate VT Digger report says that Mrs. Sanders “appears to have counted [Corinne Bove] Maietta’s bequest as a cash gift that was available as collateral to finance the land deal. The 2010 loan agreement says ‘CBM’ pledged $1 million to the school over five years in increments of $150,000, with a final payment of $100,000 in year six.” Maietta told reporters that she was incredulous that Burlington College would try to use her bequest to secure a bank loan. “You can’t borrow money on the future,” she said. “That doesn’t exist.” Burlington College closed in 2016, citing the “crushing weight of debt” which had resulted from Mrs. Sanders’s financial activities. In November 2018, a spokesman for Jane Sanders announced that the U.S. Attorney in Vermont had closed its investigation of Mrs. Sanders’s land deal and had decided not to bring any criminal charges against her. In April 2018, Sanders was one of 12 U.S. senators who sought to punish the Sinclair Broadcast Group – widely perceived as a conservative media company – which (a) consisted of 193 television stations and 614 channels in 89 markets nationwide, and (b) had recently announced plans to acquire the Tribune Media Company’s 42 TV stations in 33 markets, a merger that, if completed, would extend Sinclair’s reach to 72% of all American households. The twelve senators included Sanders and 11 Democrats: Tammy Baldwin, Richard Blumenthal, Cory Booker, Maria Cantwell, Edward Markey, Jeff Merkley, Patty Murray, Tina Smith, Tom Udall, Elizabeth Warren, and Ron Wyden. In November 2018, Sanders was re-elected to a third term in the U.S. Senate. During his campaign that year, he emphasized anthropogenic climate change — allegedly caused by excessive carbon emissions from human activity — as an issue of enormous import and urgency. For example, he wrote in an October 10 tweet: “Climate change is a planetary crisis. Our task is clear. We must take on the fossil fuel industry that’s largely responsible for global emissions and accelerate our transition toward energy efficiency and sustainable energy sources.” A week later, he tweeted: “Climate change is the single greatest threat facing our planet…. we must show up at the polls coast to coast and stand with candidates who are willing and ready to accelerate our transition to clean energy, and finally put people before the profits of polluters.” But during that same campaign, Sanders spent nearly $300,000 on private jet services just in the month of October 2018.environmental threats. This was reminiscent of Sanders’s 2016 bid for the Democratic presidential nomination, when his campaign paid $1.66 million going to the Air Charter Team just in the month of March. The following month, Sanders took 50 staffers and reporters on a chartered Delta 767 for a trip to the Vatican where he briefly met Pope Francis. On February 20, 2019, Sanders announced that he would seek the Democratic Party’s nomination for the 2020 presidential election. On March 1, 2019, Sanders hired 25-year-old Arizona activist Belén Sisa, an illegal alien describing herself as an immigrant without legal status, as a deputy press secretary. Former President Obama’s “Deferred Action for Childhood Arrivals” (DACA) program protected Sisa from deportation. Over the years, Bernie Sanders’s political campaigns have received strong support from such organizations as the AFL-CIO, the American Association for Justice, the Backbone Campaign, the Council for a Livable World, the Democratic Socialists of America, and Peace Action. Although Sanders is officially listed as an Independent, he caucuses with the Democrats and votes with them nearly 100% of the time. For an overview of Sanders’s voting record on an array of key issues, click here. For additional information on Bernie Sanders, click here.